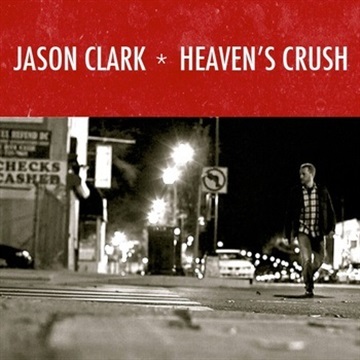 "Jason Clark returns with his first new music in many years. The former Fringe frontman also has a solo album entitled Surrendered & Untamed which also became the direction and title of his first book. Heaven’s Crush is a crowdfunded EP that accompanies his latest book, Prone to Love. While I love Jason’s written works, his music has always moved me in a powerful way. It’s the kind of music that settles the chaos and brings life into focus. The spacious, dreamy sound of the title track opens the EP in precisely that way. A variation on “I Love You Lord,” Clark’s voice is the driving-force, falling somewhere between a gentle whisper and a humble prayer. It’s a slightly surprising opening actually since it’s so intimate and reflective. “Grace” and “Becoming Like You” pick up where Surrendered & Untamed left off. They are more refined than that batch of songs, and “Becoming Like You” has more of a congregational worship bent to it, but overall the atmosphere is still much the same. “Remember” rounds out the album with its upbeat “Oh Oh Oh’s” and gorgeous guitar work. It’s likely what Dave Matthews would sound like musically if he’d never been discovered and made it big. It’s not quite as sporadic or jammy, but it’s got that same deep roots feel about it. Overall, this is another beautiful addition to Clark’s catalog. He remains one of the most talented, yet mostly undiscovered, communicators out there. The Heaven’s Crush EP is all too short in regards to time, but it more than makes up for it by the fact that every song is wonderful. If you are looking for music that will move your soul, then Heaven’s Crush is for you. Background Vocals - Madeleine Clark & Jacob Early Gang Vocals - Karen Clark, Aimee Perry, Madeleine Clark, Sarah Bellaire, Eric Perry, Nathanael Whittenburg, Nathan Dowdy & Josh Kelley, KC Clark, Julie Clark, Grayson Berkowitz, Jacob Early, Josiah Clark, Lloyd Clark, Mary Clark, John Hogan, Melody Hogan, Scott Crowder, Charissa Crowder, David Reynolds and Brandon Berg.